Friends, it seems like we’re all packing up for something these days. Most of you are preparing to head back to school or off in search of a change in scenery, but Rachel is packing her bags for the upcoming nuptials of one Mandi Roo (yes, her name is Amanda, but we choose to disregard such formalities). Roo wandered into Rachel’s life 2 days before 12South opened, and she’s been standing by her side ever since. It will undoubtably bring tears to her eyes when it’s finally time to hand her off, but at least she’ll be fully prepared with a bunny backpack stocked with kleenex. 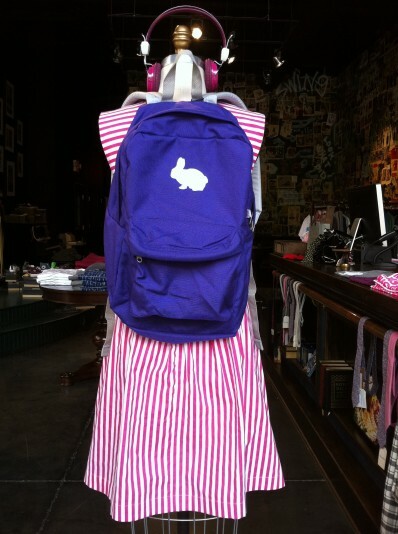 So, throw on an Emily & Fin party dress and fill your bunny pack with supplies, because a change is in the air. And dearest, darlingest Mandi Roo, no matter what your name is or where you hop off to, you’ll always be a 2L bunny! 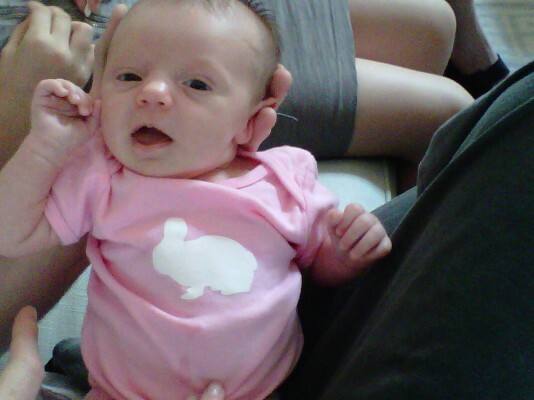 Because we’ve been talking about birthdays and family and love, now seems like the perfect time to introduce the newest, tiniest 2L bunny: Margaret Jane. Once upon a time, in a city known as Manhattan, Rachel and BFF Nancy shared an Upper East Side apartment. Eventually, as most young girls do, they grew up, covered the nation, stayed in each other’s hearts, and began to create families of their own. While Rachel has a proverbial family of wonderland bunnies, Nancy and her husband Matt welcomed this darling little lady into the world this May. She may be new to the world, but rest assured that with an “aunt” like Rachel, this little MJ will always be fabulously attired. And while we’re on the subject of new family members, check out Mary Grace in The Family section under our About tab. Little MJ may be too small to hold a hanger, but MG is settling into this 2L family beautifully. What do you get for the boy who has everything? I already got him that towel with a human outline so that your top parts never touch your bottom parts, and he already has the cute little dog and every color of Converse ever manufactured. So, I’m left with no choice but to give him the most coveted gift of all: a mention on the 2L blog. OK, in truth, this is of very little honor to him. He concepted, designed, and taught me how to use the blog, and he even has his own password, so really he could have written all of this himself. So, I’m turning to you, my loyal blog readers, especially the celebrities (I’m looking at you, GP! ), to make his birthday a special one. THE MISSION: HAPPY BIRTHDAY, @dlowe72! 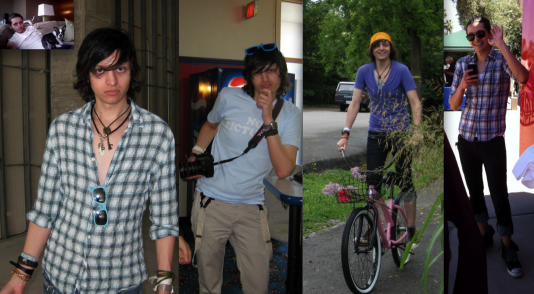 Let’s blow up his twitter so that his phone is chirping with birthday love all day long! And here’s an added incentive: whoever delivers the best Danny birthday tweet will win a piece of 2L-exclusive couture (Couture? Am I using that word right? Would that Alexis Bellino could help me out. Maybe she’ll tweet Danny!). Ready, set, go! Tweet @dlowe72 birthday love all day long!!!! Although I’m a fairly verbose girl, Mother’s Day presents a particular challenge, as I find that there are never enough words to express just how much I adore my mother. 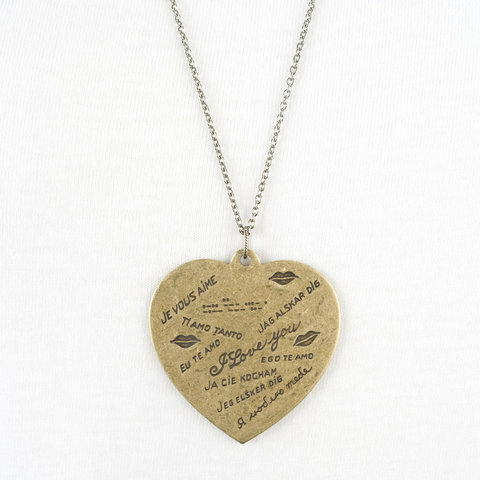 Luckily for me, this year Betsy & Iya has come to my rescue with their universal love necklace. On it you’ll find the words “I love you” in as many languages as can fit on a giant bronze heart. We only have a couple left, though, so if you’re having trouble finding the right words for your mom this weekend, we suggest getting here before the Mother’s Day shopping frenzy takes over! And to my own mother, I may not speak as many languages as the Betsy & Iya heart, but in every one I know, te amo. There are so many spring flings that we’ll be telling you about over the next week (think new cheapest essay writing service jewelry, new shoes, new lots of things!). For now, though, we’re most concerned with doing what we can to help Japan in this time of need. 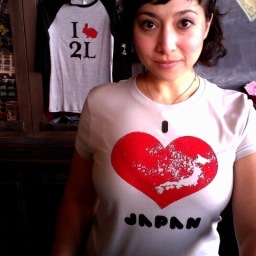 Rachel is doing her part with the I Heart Japan tee. Ricky has the men’s grey Island tee, but we only have 2 left! There are still 2 styles for men and 3 for women, and remember that Jedidiah is donating $5 from each $30 shirt to World Vision Japan Disaster Relief. Come by, and we’ll help you help them!